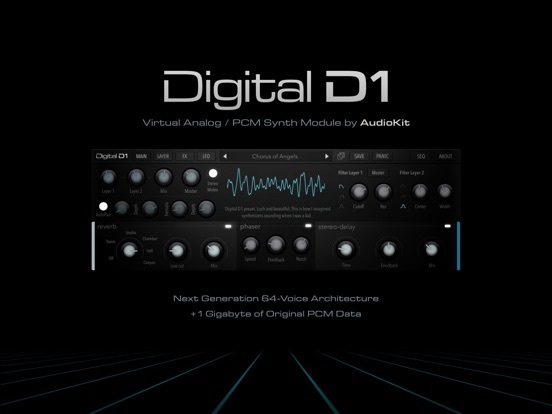 AudioKit Digital D1 Synth was updated with over 30 new destinations for the LFO to modulate. These new routing options are under the keyboard UI. You need to hide the keyboard when you're on the LFO panel. + Over 30+ New LFO destination options. Sound design fun for every one! (Hide the keyboard on the FX Panel). + We've received all your ideas/bug emails and we're working on everything. AudioKit founder Aurelius Prochazka did the keynote at the Audio Developer Conference earlier this month. He talks about the democratization of audio development that is available to us today, thanks to the easy-to-use frameworks AudioKit Pro and JUCE. If you have considered developing your own music apps, this may be the inspiration you need to get started! There really is something happening in the AudioKit space. Aure’s talk was inspiring at several level and might be a bit of a pivot, in the audio development world. Dunno how formal the relationship with SOUL will be, but that’s quite intriguing in and of itself. Makes me want to watch the announcement. There’s the issue of platform support. It sounds like people in the room may have quickly dismissed AudioKit because it’s so iOS-centric (and, in fact, iPad-centric). But Swift can work on other OSes. One of JUCE’s big strengths is in cross-platform support. Maybe there’ll be a way to leverage AudioKit frameworks in JUCE, on diverse OSes? The part about microtuning was quite interesting, to me. It may not have broad appeal, which might be the reason that Synth One tuning panel isn’t in D1. But it’s the code sharing kind of thing which can really deepen the relationship among music apps. What Aure announced sounds like the beginning of a kind of Ableton Link for tuning! That could be just awesome. But the part about this which makes it especially intriguing is the fact that it specifically connects through MPE support. Now, that is an interesting prospect, especially given the whole section about Linn’s advocacy for expressive electronic instruments. So far, there hasn’t been much MPE support in AudioKit apps. mTonal is an exception. And getting a wider range of MPE controllers can really open things up. While KB-1 is probably not built in AudioKit, it’s another part of that whole puzzle. Especially because it’s available as AUv3. Which begs the question: will the addition of AUv3 to AudioKit synths spread quickly? Devs complain about how clunky AUv3 can be. Yet, once people get good code in AudioKit Synth One, could we get a whole lot of new apps adding AUv3 support? Including AU MIDI? Sounds to me like the puzzle pieces are falling into place. MIDI-CI is a big chunk missing, and we don’t know how it’ll pan out apart from reading the specs. As we integrate diverse apps and devices, more and more, there’s an opportunity for something pretty big in the development of musicking apps. With or without fastfood placemats.